Spending a day at Kings Island isn’t just thrilling ― it can be affordable too! 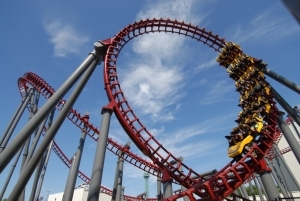 With aRes Travel, you can find the lowest prices on Kings Island tickets available anywhere. Don’t miss out on the fun of Planet Snoopy, International Street, and the Action Zone. At Kings Island, there are new thrills waiting around every corner! Kings Island does October right! What better place to celebrate Oktoberfest than Kings Island’s German-themed town? Grab a beer by Oktoberfest Lake. Then take in a show at The Festhaus while snacking on giant pretzels and bratwurst. At Kings Island Oktoberfest, you’ll feel like you’re in the heart of Bavaria! Into fear more than beer? Experience the terror of Kings Island’s Halloween Haunt. Take on a haunted maze, watch spooky live shows, and brave outdoor scare zones, all while taking in some of Kings Island’s most frightening coasters. Check out Backwoods Bayou, where the ghosts of Louisiana rise from the dead. Dare to traverse the Field of Screams. Don’t forget to visit Madame Fatale’s Cavern of Terror. Experience Halloween the Kings Island way! Kings Island has some of the best roller coasters around, including Mystic Timbers, voted the “Best New Ride” of 2017 by Amusement Today! Experience sixteen moments of airtime as you scream through an abandoned lumber yard. After that, brave the Banshee, the world’s longest steel inverted roller coaster. Hop on Diamondback, the fastest and tallest coaster in the whole park! Kings Island is also home to Planet Snoopy, voted the world’s best kids’ area for eighteen years running! 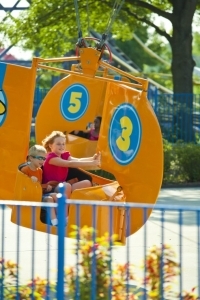 Ride Peanuts-themed rides, including four kid-friendly coasters — the Flying Ace Aerial Chase, Race for your Life Charlie Brown, The Great Pumpkin Coaster, and Woodstock Express! If your kids aren’t into coasters, they’ll have tons of fun bouncing on Snoopy’s Space Buggies, taking a ride on Snoopy’s Junction, and meeting the animals at Snoopy’s Barnyard Friends. For exclusive deals on cheap Kings Island tickets, amazing savings on packages, hotels, and some of the lowest prices on travel, call 1 (800) 434-7894 (international callers use +1 (619) 546-5622) to speak with an aRes Travel planning expert seven days a week, or book online now.